A key content strategy recommendation is to remove duplicated and redundant copy, like the above duplicated mission statements. 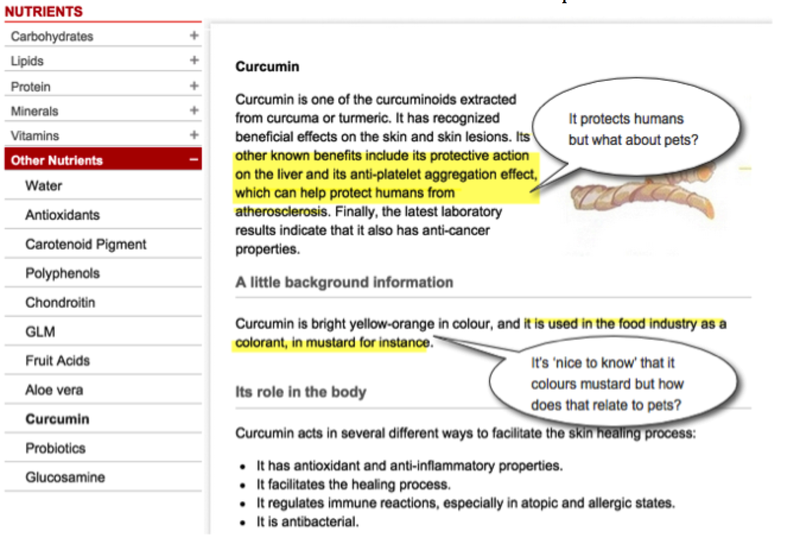 Challenge (college assignment): To hone UX, content and interactive strategy best practices, I was given the hypothetical challenge to analyze and redesign the Royal Canin Canada website (as of fall 2014). Implementing a Solution: To create a solution, I completed several research and development tasks outlined below. You may download PDF copies of each highlighted deliverable to review in more detail. Part 1 – Research – I conducted primary and secondary research to develop pet owner personas. I then completed a website audit to identify sections that met end-user personas’ needs and areas that fell short. This includes identifying practical static and multimedia content that consistently helps pet owners and other sections that sporadically offer useful information. My research uncovered content focus, messaging and navigation challenges that could confuse and frustrate customers. Within a team, I also conducted user testing to assess how easily a user could find information about a specific dry food and locate a local store that carried it. Moving toward a solution, I developed a theme and value proposition for the redesigned site and completed a competitive analysis between Royal Canin and two key competitors’ sites. 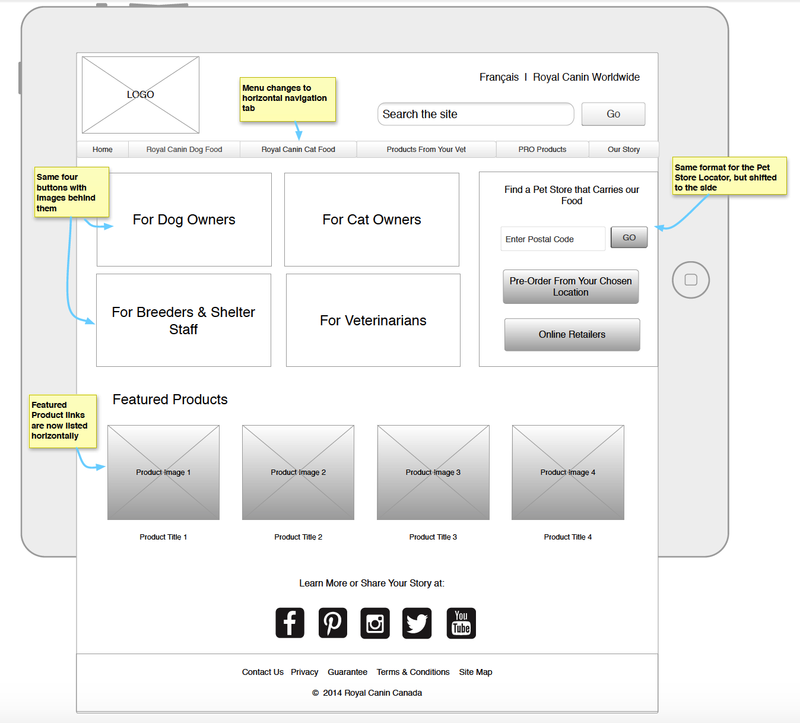 Redesigned home page wireframe, conceived collaboratively by our team and drafted by team member Megan Bell. Shift site to customer-centric focus to serve audience more than profiling Royal Canin. Edit the site to optimize opportunities to reinforce Royal Canin’s value proposition, which is to meet the specific needs of each pet’s breed, life-stage and health conditions. Streamline the site’s content to increase usability, by removing duplicated, verbose and irrelevant content (that doesn’t serve the customer). Correct inaccurate, vague or inconsistent section titles and create clearer user path navigation to help current/prospective customers achieve their goals. 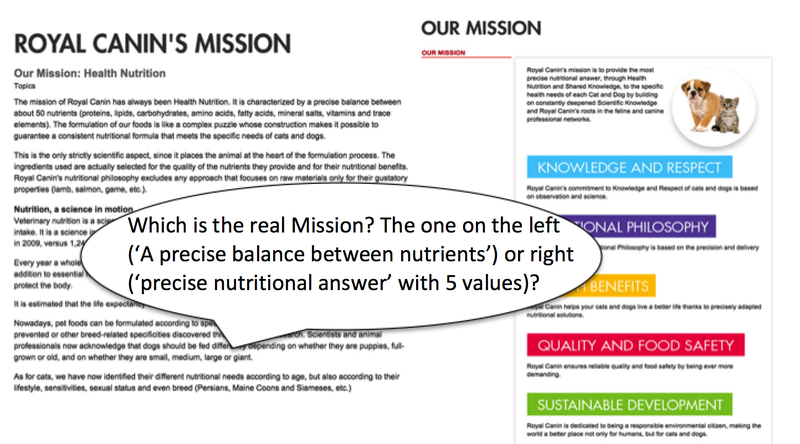 To help manage user expectations and ensure consistent content throughout (even if multiple writers create it), I developed structure and editorial guidelines for three key sections (Nutrients, Testimonials and What’s New). I also worked with a team to collaboratively propose an enhanced UX redesign, including user paths and wireframes with a mobile first approach. Results: The individual research and content strategy components earned an overall grade of 93% for content and interactive strategy assignments.